GSMArena team, 29 June 2011. Dressed to kill and with a fresh coat of paint on the interface, the Nokia X7 is keen to show there's still fight left in Symbian. The screen is a definite high point and the stainless steel body is fashioned like a stealth jet fighter. Symbian Anna adds in features that have been lacking in the OS, closing the gap on the competition. The Nokia X7 combines stainless steel and Gorilla glass into one seriously attractive package. It boasts stereo speakers (just two, rather than four as you might think looking at it) to justify its Xseries spot and an 8MP camera with 720p video recording. The screen impressed us quite a bit as you'll see in our hardware chapter but that's not all we liked about the hardware. The software changes are not as far-reaching as we would have liked, but there are some key developments that that give Symbian a usability boost. Here's the short version of what the Nokia X7 is about and what didn’t work out very well. 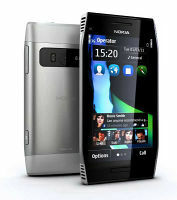 Despite our complaints, this is the best that Symbian has ever looked and Nokia has picked excellent devices to carry it. While the other one, the Nokia E6, is a business phone through and through, the X7 focuses on the fun stuff. From taking photos and videos, through deeper social networking integration, to watching HD videos and browsing the web on the large 4" screen. The Nokia X7 is something you'll want to show off to your friends. The Nokia designers have done a good job of breaking the touchscreen mould that makes so many phones look uniformly similar. The Nokia X7 comes more as a successor to the C7 than a stand-alone version. But the C7 itself will be getting Symbian Anna soon, so the X7 needs to bring more to the battlefield than just the (admittedly great) bigger screen. First we'll check on the arsenal in the box and then we're off to inspect the phone's angular charms. Join us on the next page to feast your eyes on the cool screen and discover the Nokia X7.